Kingdom Home Wallpaper is a brand that inspires the imagination with beautifully exotic patterns and an other worldly take on florals, creatures and places. Designer Kenneth King, who founded Kingdom Home in 2014, has seen great success with designs like Jungle Palm, Garden Bloom and Tulipa being sold all over the world. Now a new chapter begins with the release of a new collection of Kingdom Home Wallpaper called Art Deco. Most people are familiar with Art Deco as the architectural style of many early 20th century buildings in New York and Los Angeles. The style also exploded in Western Europe in the 1930’s. Since then it has been associated with a time gone by. Now Kenneth has revived the “style moderne” and applied it to a new line of wallpaper. When asked about the inspiration for this new collection, Ken stated, “I’ve always loved Art Deco for it’s grandeur. I love what it represents in life and how it refects time. The designs can transport one to world of fantasy and allow them live within a time of unabashed beauty and indulge in luxury.” All of Kingdom Home’s Wallpaper designs are hand-drawn. They are then digitally coloured and manipulated to make the final pattern. 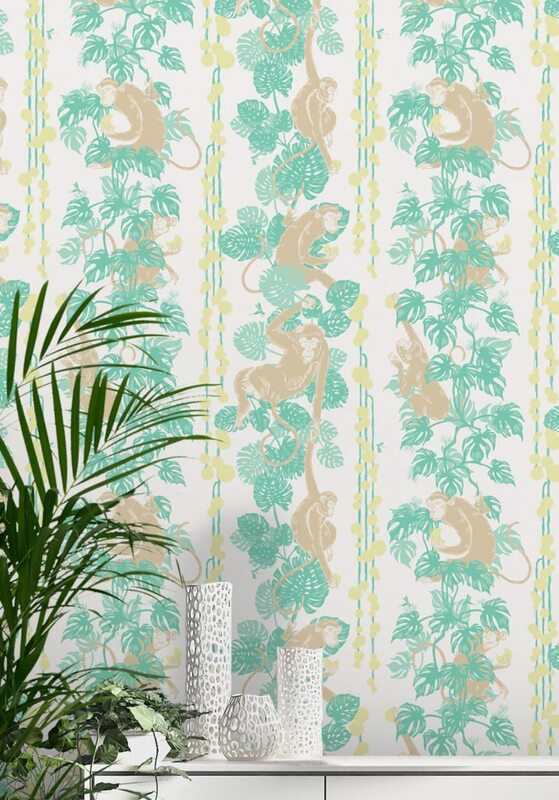 This collection is a bit of a different artistic take on Kingdom Home’s exotic aesthetic with 4 new Art Deco inspired designs: 5 Monkeys, Cavalry, La Fontaine and Leopard. For good measure, he has also released a new print outside of this new collection and in keeping with the more traditional Kingdom Home style with Viva Tropicana. We will walk you through each design and discuss the best features of each one. Our first design blends fun and elegance. 5 Monkeys was inspired by the culture of the Orient which views the monkey as a sign of good fortune. It was the most challenging of the new designs for Kenneth King. He stated, “There was a lot of trial and error in getting all monkeys to look right and be in balance and harmony with the entire piece.” Each of the five monkeys has a unique character and they are captured doing a different action among the beautiful palms and delicious fruit. This design is available in Terracotta, Soft Blue and Hawaii colours. Soft Blue is the most neutral colour of this design. There isn’t as much contrast and it seems to be the most versatile as well. 5 Monkeys will bring a playful charm to any interior. If you want a design that strikes the perfect balance between beauty and form, Cavalry is the Art Deco pattern for you. It features a majestic horse with the look of a sculpted knight chess piece that is ready to engage and conquer any interior. Cavalry is available in two colours: Chess and Serenity. Chess has a bolder look with the black horse contrasting beautifully with the paler horse. Serenity, rather, has a more subtle presentation with a difference in shade rather than colour. However, both colour options offer an equally strong aesthetic and a stunning backdrop to any interior. 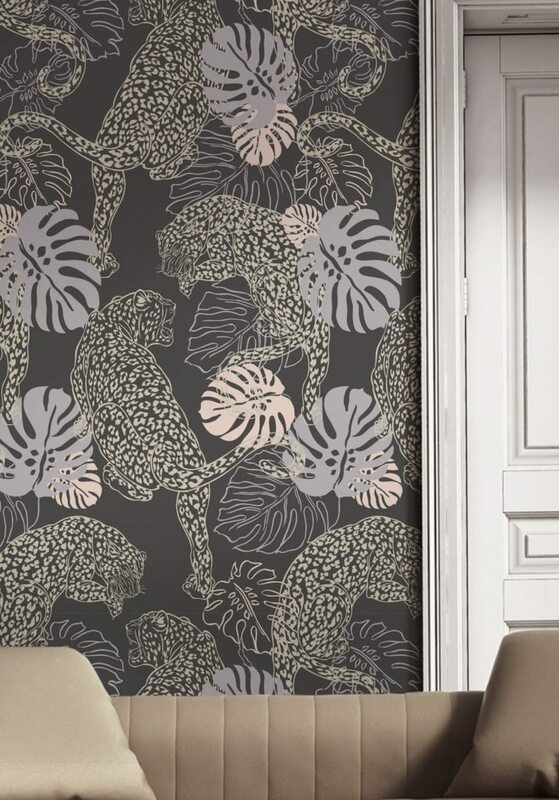 Of all the new Kingdom Home Wallpaper designs, La Fontaine is traditionally what one would expect when thinking about Art Deco. It features an opulent fountain shooting streams of water creating an endless symphony of visual movement. This piece is clearly inspired by the famous Madison Belmont building in New York City designed by Edgar Brandt. It is available in colours Paris and Greenery. La Fontaine is perfect for those seeking to create a luxurious haven of high society. If you’re bold enough make a real impression with the wardrobe of your walls, then Leopard is the undeniable choice. It’s a bold Art Deco design inspired by vintage Valentino. The pair of big cats are immediately recognizable and their presence is instantly felt. They circle each other with intent and purpose. This wallpaper will create a dynamic impact full of opulent elegance for anyone looking for a memorable encounter. Leopard is available in Cobalt, Jungle and Osaka. Finally, the last new design outside of this Art Deco collection is Viva Tropicana. The colours just explode off this design. 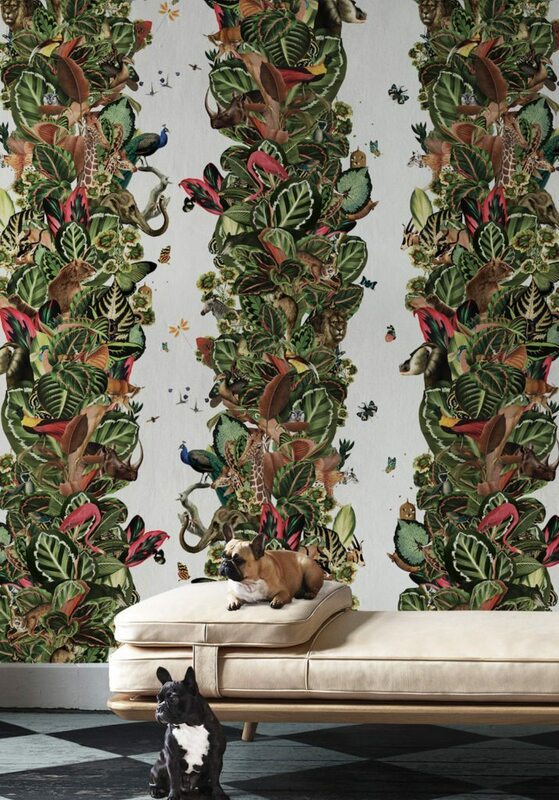 Lush florals and exotic animals are featured living in perfect harmony. Lions, antelopes, baboons, birds and butterflies live in this Eden-like tropical paradise surrounded by giant leafed botanicals. There is so much going on in this design that it requires 2 rolls (A & B) before the pattern repeats. The center space of the piece is the portion that changes with two colour options: Canvas and Duck Egg. 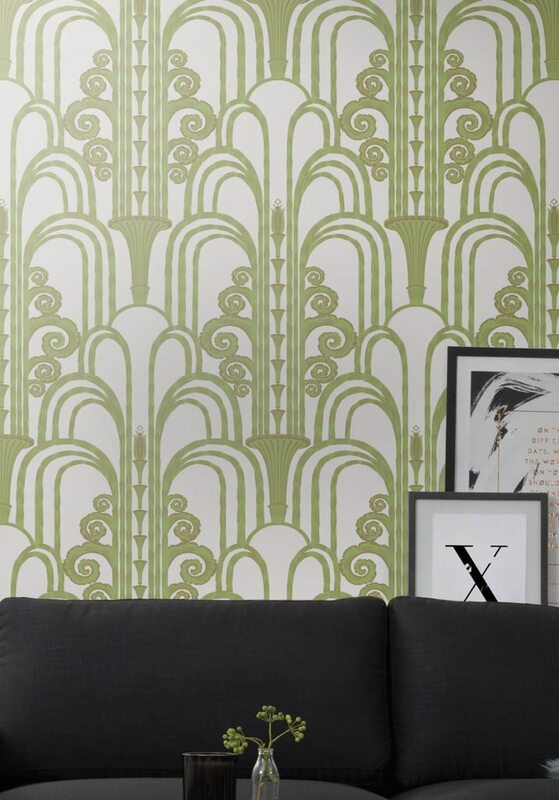 Art Deco is the common theme, yet there is so much diversity in this new range of Kingdom Home wallpaper. They range from light and elegant like Fontaine in the colour Paris to strong and dark like Cavalry in the Chess colour. You can make a bold statement with the likes of Leopard or bring in the fun with 5 Monkeys. If you’d rather go with something along the lines of what you’ve come to know and love from Kingdom Home, Viva Tropicana will satiate your taste. 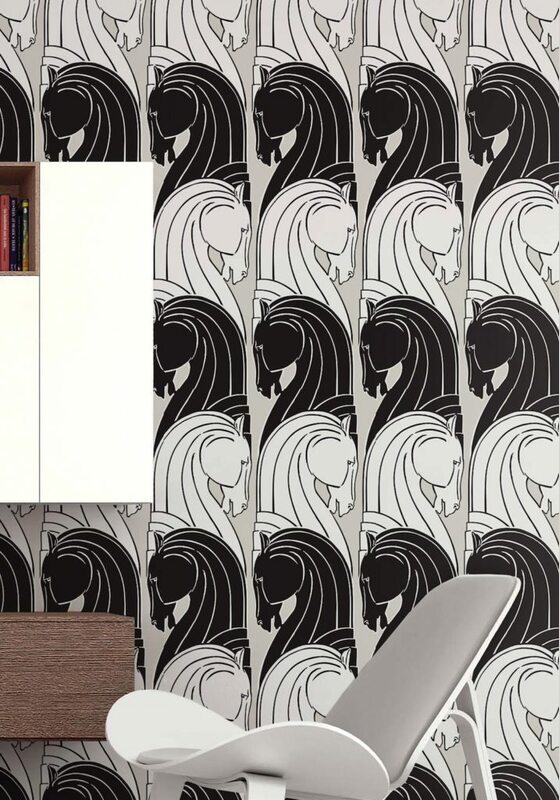 The colour options within each design also make it more likely that you’ll find the perfect wallpaper for your home. All these designs are rich with eye-catching creativity and are in keeping with the exotic style we’ve come to know and love from Kingdom Home.